A Number of Arm Pieces Are Waiting for You in This Event! This time, we have prepared Packets event. During this 3-day event, the fortune boxes will be reset everyday so that you can refresh your fortune box bar and get red Packets every day. And this time we have reduced the numbers of fortune boxes, which you can get much more Packets which own rich arm pieces such as from 5 sovereign and strong heroes. Do not miss it. During the event, players above Lv.70 can claim a fortunate box every time recharging 100 Gold. 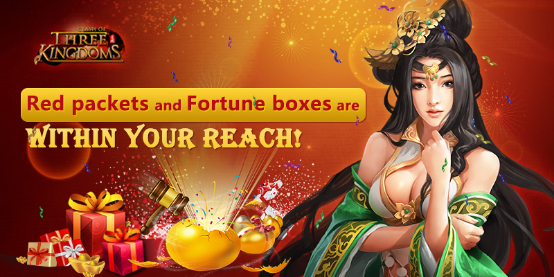 When the number of fortune boxes reach different levels, the corresponding red Packets will be rewarded to you! If you get 10 boxes, you can claim 1 Red Packets. If you get 30 boxes, you can claim 5 Red Packets. If you get 60 boxes, you can claim 15 Red Packets. If you get 130 boxes, you can claim 25 Red Packets. 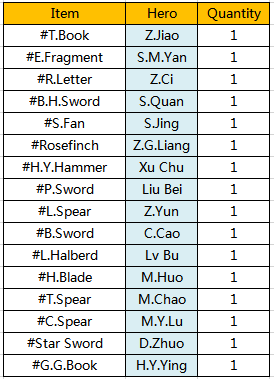 If you get 280 boxes, you can claim 46 Red Packets. Food, RO, Iron, Soul, GEM, Advanced Order, Bowlder, Super Iron, Voucher, Summon Order, A.Token, Shadow Order, Starlight, S.Slotted Fragment, S.Lantern Fragment. 1. The bar of fortune boxes will be reset every day. At the end of each day, the progress bar will be cleared. 2. In the Event, you could see ‘Treasure’ Event. 3. All fortune boxes and red Packets should be claimed before this event ends. If any of them remain unused after the event, they'll disappear automatically when the event ends.